To look for an emergency door repair service is not an everyday activity, but it happens. When the door breaks for some reason, particularly your main door, it needs to be fixed immediately. It is not a service you can schedule for a later time. Without a proper functional door, you would be exposed to anybody who would want to walk inside your home. The service availability is critical. You never know when you will need to repair a critical door. It might be in the middle of the night, while everybody is sleeping because you just arrived home to discover you need a break-in repair. A 24/7 service is truly appreciated. Promptly assistance is required to fix any issue with your door. Most companies specialized in the door market have a 24-hour service to cover any emergency situation with their clients. When a door repairman works alone, they often share their cellphones with their customers. However, since they have not too many customers, they rarely receive a call outside working hours. 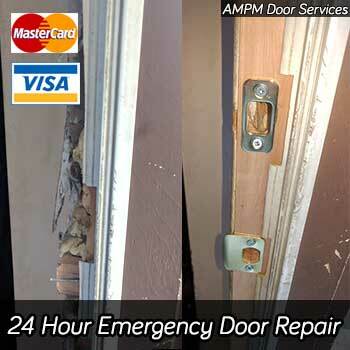 We work in the Greater Vancouver BC and are engaged with emergency door repair service for our clients. In case it is required, we can move our staff and provide you the solution to your residential or commercial entry doors. The most frequent emergency repairs come from burglars who violated the entrance door of homes. They break in using brute force, particularly after the popularization of high-security locks for entry doors. To let themselves in, they break the frame since it is the most vulnerable part of the door. In such cases, an emergency door frame repair is required. Another standard issue is kicked doors. They are more common in internal doors that need to be opened. At times, it is the owner who kicked its own door. That is the case when the door is locked, or the keys are lost. In a burglar situation, only when the house has closed doors it can happen, but that is not common. Most homes leave their internal doors open all the time. Any emergency door repairman or company has to have first a strong commitment to your safety. Any door repair during an emergency situation is essential to keep you safe. A locksmith attending to an emergency call must have all the necessary equipment and even temporary parts and common components to be able to perform a repair. When the door is broken, that ca be the hardest job, because no locksmith can carry a door to attend an emergency situation. However, a temporary frame reinforcement or even an additional lock in another position can be easily implemented if the door repairman has the right tools and parts. We are committed to your safety, and our staff is prepared to solve any eventuality. If we don’t have it with us, we can come up with a creative solution to keep you safe. The goal of an emergency door repair service is to close the door. Its purpose is to keep you as safe as possible under the given circumstances. Some fixes are so easy that they can be done within a few hours, but others can be more complex. In such cases, the emergency door repair should limit to the least functional repair, leaving the rest to a follow-up visit. Typically aesthetic repairs can be left for later. Such repairs do not affect functionality, and they can be scheduled at a more appropriate time. Another reason to reschedule work during an emergency repair is to wait for replacements or spare parts. Some emergency repairs require the replacement of a broken part, and then the door is left with the minimum functionality. Improvements to a lock are common once somebody has violated its security. Those improvements are typically scheduled within the following days, once the necessary new locks arrive at the installation site.